Malana has had enough. Jamie would have easily bested the other girls and perhaps drowned Kalea eventually. Whether she’s trying to save her beloved sister and best friend, or she is filled with total hatred at Jamie’s betrayal, it’s hard to tell. All we know now is that it’s the end for Jamie. 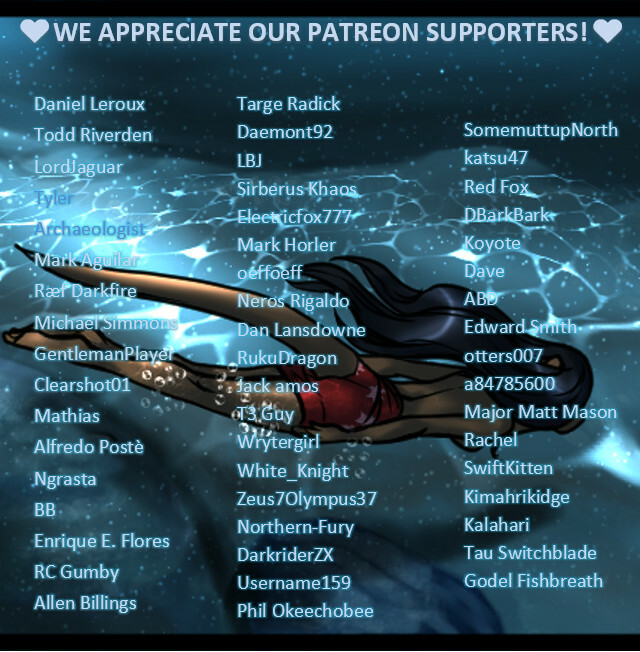 If you wish to support the creation of this project, and receive early page peeks, work-in-progress, special art, side-comics, animation, short stories, and more, visit The Depths Patreon by clicking on the image below. Only $5.00 to join! You keep spoiling us with all these well-placed surprises! Nicely done! Hell has no fury as a female’s scorn. This must really be sayonara to Jamie. Jamie really is not sorry at all, and I’m not sorry for his fate. I knew that knife would come into play. Welcome to Davy Jones’ locker, Jamie. I can only hope that his grip on Malana will fail and she can be brought back to the surface safely. Oops, my mistake. Should have been Kalea, instead of Malana. I apologize for my character mixup. Even though I muffed my guess completely, I have to say that I was drawn to the look of fire in Malana’s eyes. My compliments to the originator or originators of that idea. Well, like has been pointed out, Malana has a fire within her. Cross her and, hmm… some advice. Oh, we’re aware of it. We dropped TopWebcomics from our list, based in part that we weren’t getting any new traffic from there at all, and most readers who came from there have stayed here. *^^* So…no more need to vote. ^^ WE KNOW WE’RE GOOD. In fact…WE KNOW WE’RE AMONG THE BEST WEB COMICS OUT THERE. *^^* We don’t need to enter a popularity contest to prove it. I actually found you from TWC like 4-5 days ago. This is some good stuff. Awesome, we’re so glad to have you join us! Well, definitely hope we continue to impress you. *^^* And feel free to tell others, or hop into our Patreon for even more stuff. What was that? Sorry, Jamie, didn’t quite catch that. You, uh…got something in your throat there? With that first lung-full of water, he’ll become very heavy and sink like a stone, especially with the added weight of that flooding diving helmet. I’d say David would be going to save Leilani, and Jamie might end up grabbing him. He was very much out of air, and a single lungful won’t keep you long when your blood is saturating with CO2. Leilani would have nothing left to share, either. The shipfull of wolves likely wouldn’t be very happy either if all they reel back in is pair of cut hoses. At this point everyone below would likely have to get into the cave to survive, for various reasons. If Jamie holds onto David, there shouldn’t be any question at this point he’d have a lot more endurance left – long enough that he could quite easily drown him along. Whether the otters could still save him (possibly making further use of the knife) – that could be written either way. If this is still meant as a prologue for the real story.. I’d say this could very well be the point where we say goodbye to all of the wolves. Not going to say what’s going to happen, you’ll know more Monday. We’ve tried really hard to keep the readers guessing. Thanks for the comment! A good kick to the ‘nads should shock him out of whatever breath he’s holding, and then his grip on her should fail quite quickly. Jamie should have focused more on saving what breath he could, instead of trying to plead with Malana.